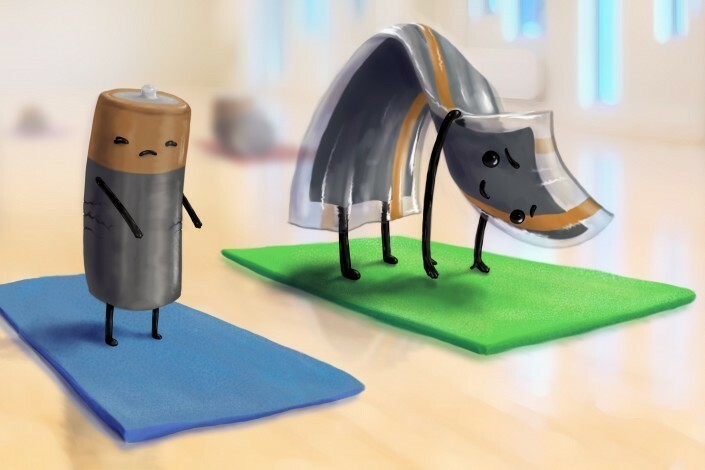 Imagine a world where you could turn anything into a battery, just by spraying it. The energized liquid could be applied graffiti style to anything – your clothes, your car, even an aeroplane. Now imagine this impossible power source was also washing-machine-proof and flame-proof – even bullet proof. It might sound far-fetched, but scientists are getting close to a breakthrough. Jodie Lutkenhaus and her team at Texas A&M University have managed to take the elements of a lithium-ion battery – electrodes, metal, polymer – and turn them into sprayable liquids. They’ve airbrushed the batteries onto various surfaces, layer by layer, and successfully transformed them into viable energy sources. "All you need is two connectors and you're plugged in," says Lutkenhaus. The implications are immense. Apart from how fun it would be to wear clothes that lit up or played video, or cooled you down when the heat was on, lightweight wearable batteries could offer wider public benefits. They could revolutionize healthcare, for instance. Think of patients with wearable monitors and biometric patches – many of which come with clunky, uncomfortable battery cells that need to be recharged. They also have significant military applications. The average soldier carries around 20lb of batteries as part of their battle gear, so reducing this burden would be an obvious boon to comfort and efficiency. But why stop there? As advantageous as it is to be fleet-footed on the battlefield, it doesn't count for much if the lightweight batteries rupture under pressure or combust on contact with heat. That’s why Lutkenhaus is currently working on a new type of battery that can withstand gunfire. "We took the batteries out to a firing range to test them. This is Texas, after all," she said. "And you know what? They withstood the bullets." She’s also working with organic, flame-proof polymer batteries that are naturally flame-retardant. "We want to avoid another situation like the Tesla Model S electric car , when a stone hit the vehicle battery and it blew up," she explains. So, they're sprayable, wearable and even bullet-proof – but these aren't the only novel battery formats Lutkenhaus is working on. There’s also the “structural” battery, a material so mechanically strong it could be put to use as a car part or aeroplane wing. Planes could fly longer without refuelling, electric cars could go farther without needing to recharge. “I expect these new battery formats to be improving transport, healthcare, the military – life in general – within the next five years,” says Lutkenhaus.